The Scottish Government announced income tax rises in its budget for 2018. Do these achieve what they claim to achieve? Despite making noises about not raising income tax, the SNP-led Scottish Government did precisely that this week. According to finance secretary Derek McKay, these changes make “Scotland’s income tax system even fairer and more progressive”. The end result means an extra £164m for the Scottish Government to spend funded by income tax rises, mostly for the NHS, nursery education and local government. The Scottish Government have made the income structure more complicated. Where three tax rates previously existed, there are now five. Three of these just separated by steps of 1%. The first £2000 attracts a lower basic “starter” rate of 19% whereas after £24000, the 20% becomes 21%. Higher tax rates also increase from 40% and 45% to 41% and 46%. What he avoids saying, however, is that “slightly less tax” will amount to no more than £20. 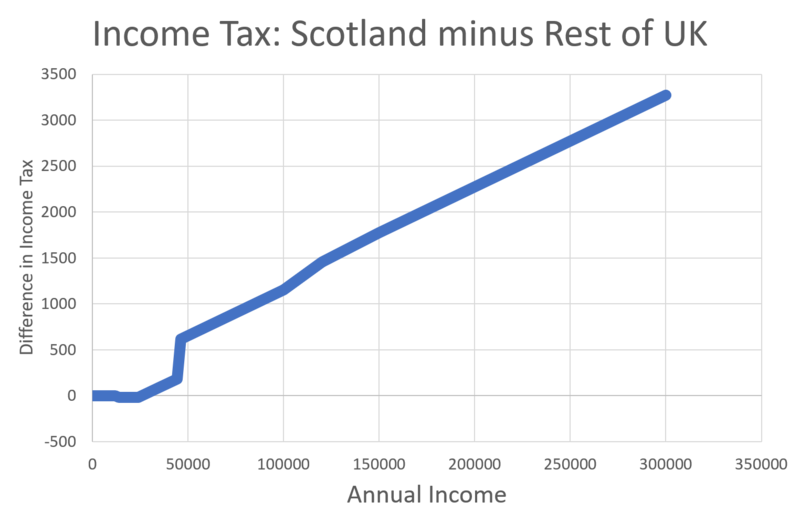 Here is the complete picture, where we compare Scotland’s income taxation to the rest of the UK’s. You can hardly make out the £20 tax cut. Remark: The Scottish income tax regime was close to but not the same as that of rUK before the budgets. Interestingly, both Labour and Green leaders state that the tax rises don’t go far enough. 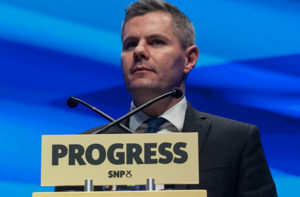 Scottish Labour leader Richard Leonard said “…they did not ask those with the most, those with the broadest shoulders, those with the wealth, to pay their fair share.” Implying that he would like to have seen more tax taken from high earners or even some kind of wealth tax, although the latter isn’t Scottish labour policy. For the Greens, Andy Wightman said that “We want a real terms increase (in council budgets) and that would involve somewhere in the region of £150m as I calculate it this morning”. As the budget stands, it falls short of what the Greens can support, again implying more taxation. The Green Party campaigned for even higher income tax rises than Labour at the last election. The LibDems too were looking for more, again a party advocating more taxation. The SNP is in a hard place. It would rather not raise taxes, especially with a resurgent Scottish Conservative party campaigning for spending cuts and tax cuts and, basically, to make Scotland more like the rest of the UK. And with the remaining parties very much in the tax-raising camp, it can set itself apart from them among voters. On the other hand, the SNP has made a big noise about opposing “austerity”, imposed by the (Conservative) UK government. It is limited in what it can do without an increase in its budget, and that’s not going to come from Westminster, who already feel generous with their £2bn support last month, a figure that’s been contested by other parties. The increases are fairly modest, however. The tax cut is only £20 at most, and someone on £100,000 would be £1,155 better off south of the border. Not irrelevant, but not overly damaging to the SNP’s reputation either. Someone on £40,000 would see only £140 over and above their southern equivalent, about the cost of a cup of coffee each week. As a final thought, this budget was really a draft budget. It will need support from other parties because the SNP is just short of an overall majority. The Greens are their usual supporters, but they may ask for an upward revision to some of the figures. Or, could the Scottish Conservatives decide to back the budget for fear it could get further away from their preferred place of no tax increases at all? I don’t like income tax. It’s a tax on work, which is a tax on the time we spend to bring in money to improve our lives. Search this site for my thoughts on flat tax, land value tax and unearned income. They’re everywhere. That aside, the amounts aren’t punitive and it might not be too long before taxes in the rest of the UK will also need to rise. The only question is: Will the government spend this new money wisely? I’m not clairvoyant so time will tell. If there are no tangible benefits from the tax increases then other parties will rightly criticise them.